Julie Hiner, Author, Cycling Advocate & Philanthropist, will facilitate an intimate breakout discussion on Specificity: Know Your End Game and Take Progressive Action to Get There. What are you ready for that you are not taking on? We often hold ourselves back due to uncertainty, fear, and lack of self-belief. Taking the first step by admitting what it is you truly want to go after but are avoiding can open up a door, allowing you to move forward. By defining your ultimate goal and breaking it into doable, reachable and believable steps, you can start making progress and building momentum. Being crystal clear with what your end game is and what pieces need to be in place to reach it enables you to take positive and progressive action. Join Julie and a small group of local #YYC PowHERhouses for a PowHERPOD session on Thursday, April 12 from noon-1:30 pm at the IMPACT Magazine office, 2007 – 2nd Street SW, Calgary. A light lunch will be supplied. This mini-mastermind provides the opportunity for our WOMEN BUILT2SCALE Accelerator participants to deep-dive into a particular topic with a focused conversation to deliver not only tangible and implementable outcomes but also budding new relationships with like-minded women on the same scaling-track you are on! The session will combine journaling, sharing, visualization, and stimulating discussion to help you discover what your ultimate goal is and how to start moving towards it today! Please bring your favourite journal and pen. REGISTER NOW TO SAVE YOUR SPOT! 1. What are you READY for that you are not taking on? What is holding you back? An opportunity to dig deep and uncover what your true desires are through a combination of free writing, sharing and discussion. 2. Define your ultimate goal and breaking it into reachable steps. An opportunity to capture visually what the components or buckets are that will move you towards your ultimate goal, followed sharing and discussion. 3. Build a clear path to your End Game. A chance to get crystal clear by visualizing your end game (ultimate goal/true desires) and detail the components that you will effectively bring together to reach it. Julie has lived in Calgary her whole life and continues to enjoy being so close to the mountains and surrounded by a multitude of parks and trails. She is a graduate of the University of Calgary, with an MSc in Computer Science specializing in network simulation. Julie has over a decade of experience as an IT professional, working on large scale, critical network systems. 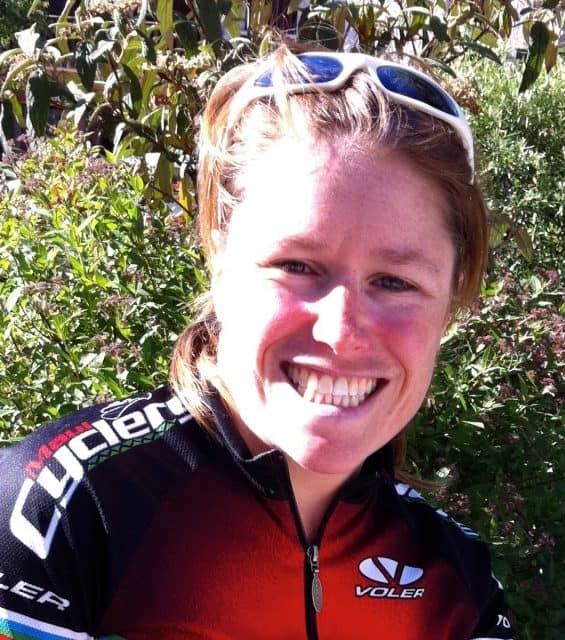 She shares a passion for the outdoors, and specifically for road cycling, with her husband. Their travels have taken them to many famous mountains belonging to the professional races. Her love of writing has been re-ignited over the past few years, during which time she self-published her first book, capturing her own inspirational story of overcoming weight and anxiety issues by finding her own inner athlete. All proceeds from book sales are being donated to the World Bicycle Relief. Julie is also an inspirational blogger and speaker – JustAGirlAndABike.com. PowHERhouse is a national women’s media organization with a strong focus on social impact, providing a supportive ecosystem that creates positive systemic change in the lives of girls and women while acting as an educational and economic driver. As a catalyst, conduit, curator and convener, PowHERhouse utilizes publications, partnerships, well-curated online content and strategic live events to mobilize more women forward – faster. Behind everything we do is a solid women’s advocacy message and clear communication of our mission to rocket more women into influential, senior leadership roles – in organizations, on boards, in politics, and leading in global business headquartered in Canada. Our Spring 2018 WOMEN BUILT2SCALE Calgary Accelerator Series is the current demonstration of our work in the world April 11-15.